Welcome to Brett's Online Store! Your source for printing equipment, print finishing equipment and more! Everything you need to produce your print communications; new & used equipment, supplies & accessories & user replaceable parts. New Equipment - From start to finish and everything in between! Including; Digital Printing Systems, Print Finishing Systems, Mailroom Systems, Office Systems, Packaging Systems and more! Used & Demo Equipment - When the budget doesn't allow or the process quantity or frequency of use doesn't justify a new purchase an excellent alternative is to purchase used. Supplies - Our most popular supply choices can be found here. 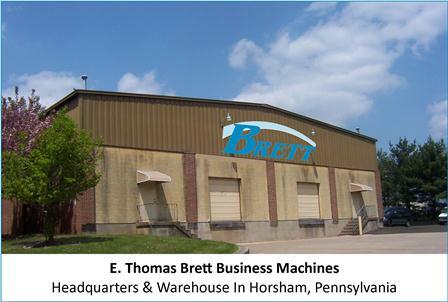 We carry a complete line of supplies with most stocked at our Horsham, PA warehouse. If you don't see the supply items you need please contact us. User Replaceable Parts - These parts typically include parts that are easily accessable and easily changed. Parts that require more extensive disassembly, reassembly, special tools or adjustments are typically installed by our factory trained service technicians. We carry parts for all the equipment we sell; if you need a specific part and don’t see it in our store, please contact us.